Brought To You by GEICO Motorcycle for 2015! (Mitchell, SD) April 8, 2015 – How would you like to score a huge list of parts and accessories for you and your motorcycle? 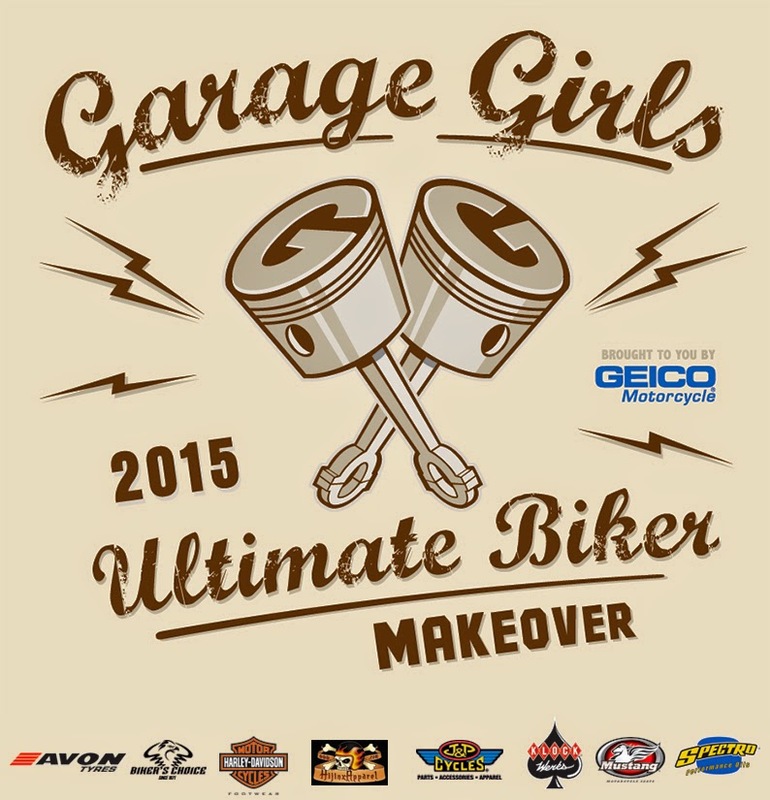 You can, if you enter the Garage-Girls Ultimate Biker Makeover 2015, brought to you by GEICO Motorcycle. Contestants (girls and guys) must submit an essay 600 words or less as well as a photo (jpeg no larger than 5mb) to bikermakeover@garage-girls.com, describing why they are most in need of a biker makeover. The deadline for entries is July 8, 2015. Submissions will be narrowed down to the final four by a select panel of judges from Garage-Girls based on who they feel most deserves the Ultimate Biker Makeover. synthetic oil from Spectro Oils; a new Mustang Motorcycle Seat; a set of tires from AVON Tires; a motorcycle helmet, jacket and gloves by J&P Cycles and Roland Sands Designs; clothing by Hinjinx Apparel; Motorcycle Parts by Bikers Choice, Klock Werks and MUCH MORE!! The winner will be announced online at www.garage-girls.com and live by GEICO Motorcycle on the Buffalo Chip Stage, Monday, August 3, 2015, during the 75th Anniversary Sturgis Rally. The Garage-Girls Ultimate Biker Makeover is a well-established contest entering it’s 7th year offering an opportunity to a well deserving winner the chance to get “Hooked UP” from major supporting sponsors. Contestants are encouraged to submit a 600 words or less essay – describing why they are most in need of a biker makeover. Submissions are narrowed down to the final four by selected judges from Garage-Girls. From there, the judges decide who they feel most deserves the Ultimate Biker Makeover and the opportunity to take home all the prizes! For more information, please contact Sara Liberte at Sara@kustomcycles.com. GEICO (Government Employees Insurance Company) is a member of the Berkshire Hathaway family of companies and is the second-largest private passenger auto insurance company in the United States. GEICO, which was founded in 1936, provides millions of auto insurance quotes to U.S. drivers annually. The company is pleased to serve more than 13 million private passenger customers and insures more than 22 million vehicles (auto & cycle). GEICO’s online service center helps policyholders take care of policy sales, policy changes and claims reporting, and print insurance ID cards. Policyholders can also connect to GEICO through the GEICO App, reach a representative over the phone or visit a GEICO local agent.GEICO also provides insurance quotes on motorcycles, boats, all-terrain vehicles (ATVs), travel trailers and motorhomes (RVs). Coverage for life, homes and apartments is written by non-affiliated insurance companies and is secured through the GEICO Insurance Agency, Inc. Commercial auto insurance and personal umbrella protection are also available. For more information, go to www.geico.com. For more information, go to www.geico.com.